this dotpup contains a new gtk-theme switcher (the old gtk-theme script in /usr/sbin has been edited). it comes with the xfce gtk theme engines and the plastig gtk theme engine. you dont necessarily need xfce installed for these to work. it will not slow down your system. it will also work as a common theme swither for xfce users. however it will require some reconfiguring for xfce users for it to work. 2. click to install. because this is a common dotpup for xfce and non xfce users some of the files will be overwritten during installation. 4. delete all the folders in /usr/share/themes except default and default-4.0 (these files are now copied to /etc/gtk). Very nice themes. Guys, could you help me on how to install this theme in Puppy 1.0.5. I want to change the toolbars icons in something I want. I will be using the Puppy XP theme dotpup. Wish someone could incorporate the theme to Puppy. Then also the small Dotpup I add to this message. Comment out the 4 lines, that set Background-pixmaps. 1. choose "use Puppys internal Theme" and select "quiet". You can see, that Gtk1-programs like leafpad don't look exactly like Gtk2-programs (rox). This is done somewhere else, I did not have a closer look yet. wow. thanks! I'll try that. maybe this is what you need to "have a closer look" but I'm not sure. I checked the ROX website. But my problem: where are these icons located? >But my problem: where are these icons located? I added this too, no effect. So they must be downloaded seperately I think. The ones from your Screenshot seem to be called "ximian-icons", so maybe at http://themes.freshmeat.net they can be found all in one file. Ok, I tried it, but without effect. 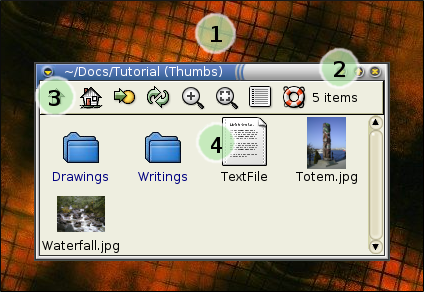 Puppy uses an older ROX, that uses Gtk1. I think for the Icons you need Gtk2. You can download rox 2.3 from the Dotpup-Wiki or using the Dotpup-Downloader. It seems to delete all existing Desktop-Icons, and replaces them with the Standard-Puppy-Configuration. The icons are very beautifull, but drag'n'drop to muzip and Dotpup-Wizard does not work with it. I must have a closer look next weekend maybe.